A process called the nitrogen cycle makes it possible to keep fish alive in aquariums. Usually, fish hobbyists use live fish to get this process going, but that doesn't work very well for African cichlids. 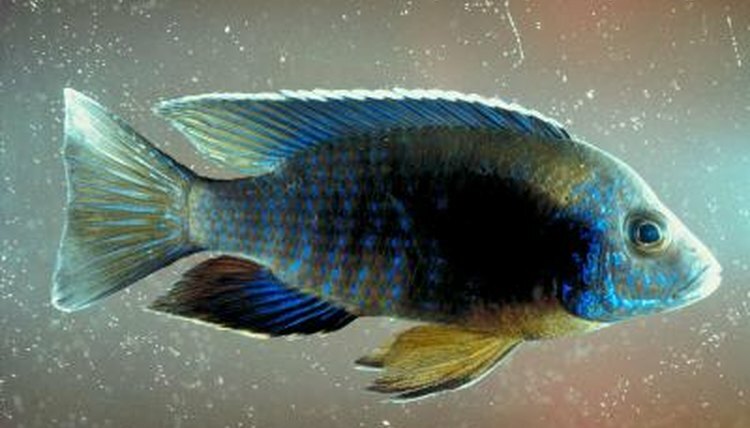 For African cichlids, a method called fishless cycling works better for a number of reason. In the nitrogen cycle, fish produce toxic ammonia as a waste product. Then, various bacteria break the ammonia down into less toxic nitrite, then nitrate. However, it takes a while to build up enough ammonia-eating bacteria for this process to run smoothly. For this reason, you usually can kick off this cycle with fish that can survive that initial ammonia spike. However, African cichlids prefer water with a high pH, which makes ammonia particularly toxic. Plus, it's best to introduce all of your fish at once with African cichlids to reduce aggression. Fortunately, you can cycle a tank all at once with chemical ammonia to eliminate these obstacles. Fishless cycling requires a few common supplies. Test kits for ammonia and nitrite can be purchased cheaply at most pet shops. Make sure you get ammonia that doesn't have surfactants or scents. The label doesn't always say if ammonia contains surfactants, but you can figure it out by shaking the bottle. If the ammonia foams when you shake it, it has surfactants. You also will need a bucket. To start, you must figure out how much ammonia to add. Every tank works a little differently. First, fill a bucket with tank water. Then, add ammonia, one drop at a time. Stir the water thoroughly. Test the water after every drop, and keep track of how many drops you've added. Stop once you reach 4-5 ppm of ammonia. Calculate how many drops you will need on the main aquarium based on your bucket. For example, if you have a one gallon bucket and a 10 gallon tank, your tank will need 10 times as many drops of ammonia. Add the amount of ammonia you calculated in the last step to the main tank. Once a day, test the water, then add the same amount of ammonia. You will see the ammonia levels in the tank "spike," then decline. Nitrite will follow suit with a lag. Do not try and speed the process by adding larger amounts of ammonia, this actually can slow the process. Eventually, the ammonia and nitrite levels will drop to zero, even with the ammonia you are adding to the tank. This process usually takes 10 days to a month. Once your ammonia and nitrite levels remain at zero for seven days, despite "feeding" the tank, you are ready for fish. Continue to add ammonia until you are about to pick up your fish. The day you are getting your fish, perform a water change of at least 75 gallons just before you add your cichlids. Adding all of your African cichlids at once prevents fish from getting a jump start on establishing territories and picking on newcomers.